The 7th Annual Women Arts Festival is approaching. We are ready. Are you? Who can believe it’s almost been a year since our last festival? It didn’t seem that far ago since we were dancing to the rhythm of steel drums from the Rainbow Girls, gazing in awe at the visual works of art from influences such as Aramis Hamer, and stopping ourselves from accompanying Mari Soul and Animals of Grace on stage. Well, if you missed out, it’s okay. We’re back again for the 7th Annual Isis Women Arts Festival on Saturday, May 14th. This time we are setting up the stage at the Northwest African American Museum in Seattle. Join us for an evening of dance, music,poetry, breathtaking art, and more. Doors open at 7:30pm. See you there! Oh and how could we forget: Admission is free. 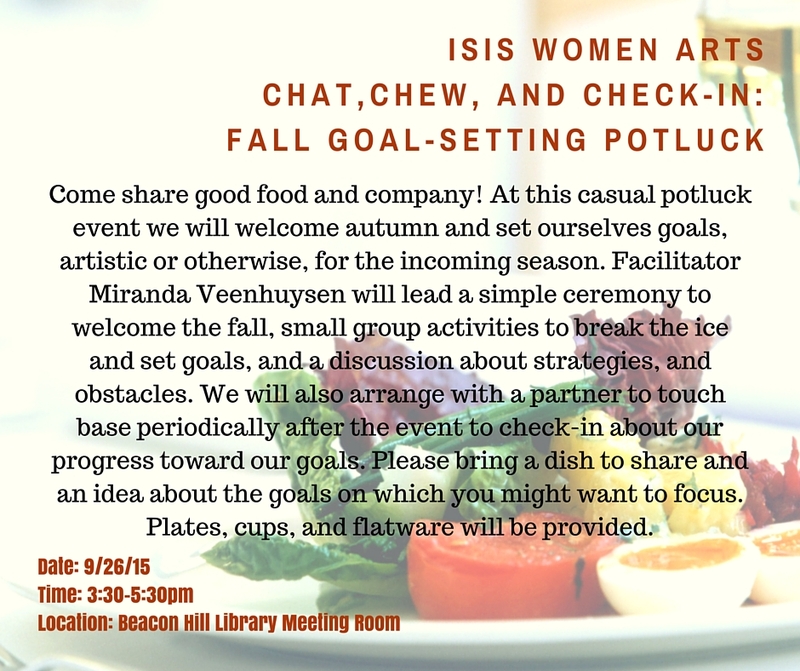 Isis Women Arts invites you to join us for an afternoon of delectable treats and artistic goal setting. We’ll be at Beacon Library Meeting Room on Saturday, September 26, 2015 from 3:30-5:30 pm. Isis Women Arts goddess Miranda Veenhuysen will serve as the facilitator. Come on out, bring a dish, enjoy discussions, and develop goals and strategies for a prosperous year. FREE admission. Click here to RSVP. Seattle community-building collective for woman-identified artists. We are "artistic goddesses shattering the mold."